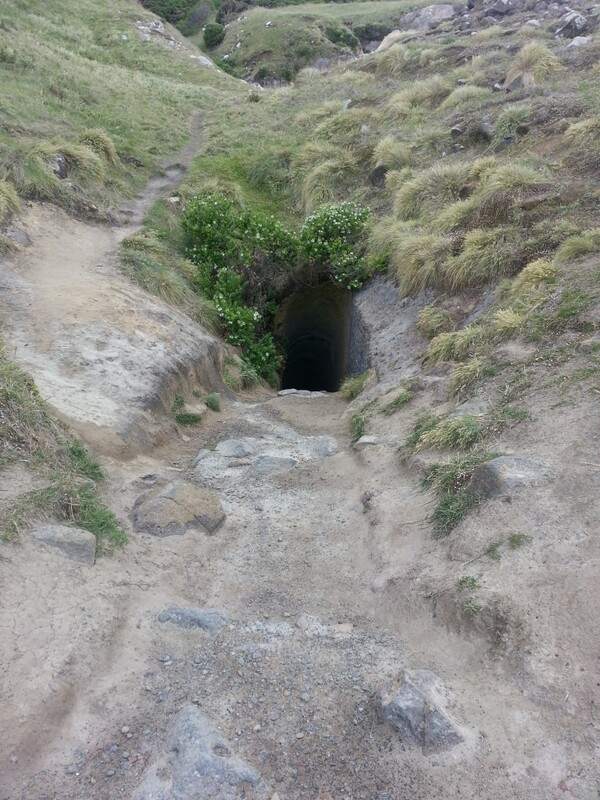 Today we visited one of Dunedin’s old classics – the popular and oft-recommended Tunnel Beach. It’s a place of spectacular beauty where history and local mythology mix, all only a few minutes from the city. We headed up through Corstophine on to Blackhead Rd, then turned left on to Tunnel Beach Rd and pulled up in the parking area. Even though it was early, there were already a few others here. We jumped the stile and headed down the track, the ocean filling the view ahead of us. At first we could see nothing of the coastline, but as we descended the vista unfolded before us, sandstone cliffs carved into strange and dramatic shapes as the powerful ocean crashed against them, throwing spray up into the air. The track lead us to the base of a unique headland, natural arch on one side and towering buttress on the other. The famous tunnel itself is actually surprisingly well-hidden – I was fairly close before I spotted the narrow entrance framed by hebe. 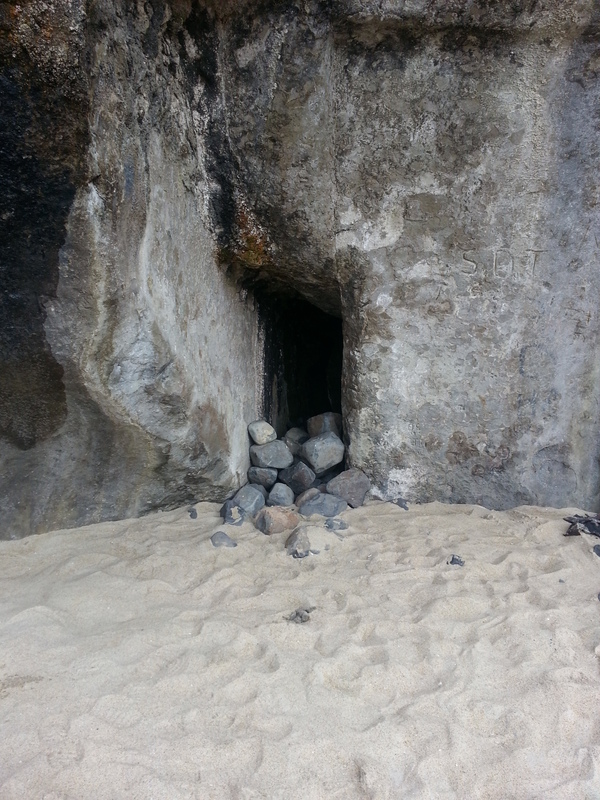 The tunnel was built in the 1870s at the request of John Cargill, whose residence Sea View was nearby. John Cargill was the son of William Cargill and brother of Edward Bowes Cargill, who built Cargill’s Castle which now stands in ruins not far up the coast. It’s said that John Cargill had it built as a gift for his daughters, or to provide them with a private bathing spot to safeguard their modesty, but I don’t know whether that’s the truth or part of the legend. Perhaps he just wanted a cool private beach – seems motivation enough to me! 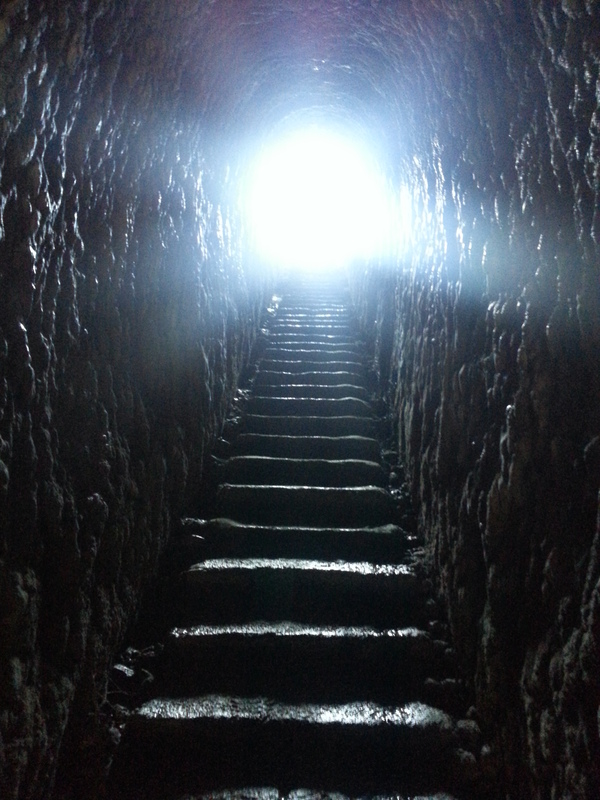 We entered the tunnel. The walls are rough, still bearing tool marks from the workmen who built it, and the concrete steps (which were added in 1983 when this walkway was opened to the public) are narrow and plastered with damp sand. Then we emerged in the small bay below. The beach was strewn with huge boulders and surrounded on every side by looming cliffs. “I think one of Cargill’s daughters drowned here.” Said dad. The tale – which crops up in tourism materials as well as being passed along by word of mouth – is a slippery one to pin down. Some say the unfortunate young woman drowned on her sixteenth birthday. Some go as far as to say there were two daughters who died. The sad conclusion to the story is that John Cargill was so heartbroken that he left and never returned. Problem is, I’m not the kind of nerd who can just leave a romantic legend alone. If I’m going to re-tell the story then I need a name, a date, the circumstances…and that’s where I run up against a wall. The Dunedin Family History Group has investigated this much more thoroughly than I could do, poring through newspaper archives, death certificates and burials, and confirmed to me that so far no evidence has been uncovered of such a thing happening. Additionally, tracing the fates of all daughters of both John and Edward Bowes Cargill confirms that none of them drowned. John Cargill did leave New Zealand in 1884, but his obituary unromantically puts this down to heavy financial losses on his central Otago sheep runs, the result of exploding rabbit populations and falling wool prices. So unless any new evidence comes to light, we are forced to conclude that this drowning is simply a product of local imagination. Still, there is plenty here to interest an explorer. Passers by over the years have left their marks on the sandstone walls, and it is an interesting exercise to try to find the oldest. Many have been washed away by the waves over the years but some are still remarkably clear. 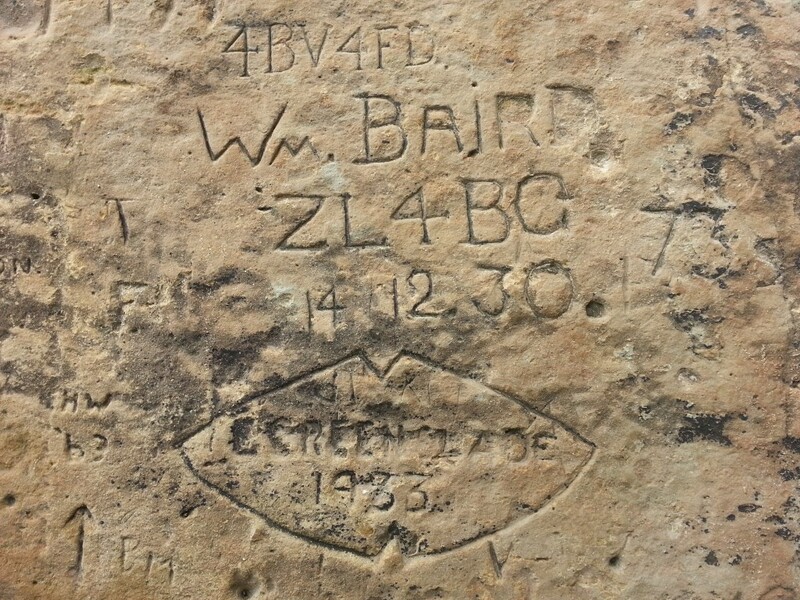 Perhaps William Baird was a ham radio enthusiast? I spotted another small cave and decided to see how far it reached. But when I stepped inside I disturbed hundreds of flies, which swarmed me. I fled in horror and decided that was a job for another adventurer. Once I recovered from the traumatic experience, we decided to head back. So it was back into the gloomy tunnel for us. Followed by a tiring walk back up the hill. Luckily there were some conveniently placed benches we could rest on while enjoying the view. Behind us we left the dramatic little cove, and the ghost of the drowned maiden who may never have existed. Huh. I didn’t even know the public was allowed down there anymore! Someone told me it was closed, and it never occurred to me to question that. Dammit now it’ll have to wait until I get back from Auckland! Great post though, and I LOLed at the thought of you as Amateur Love Detective: History. We headed down there on New Years day 2017 and enjoyed the steep walk back up! Amazing how the track has changed from a basic outline in the grass, which made for a lot of slip-sliding your way downk into a full blown tourist route. 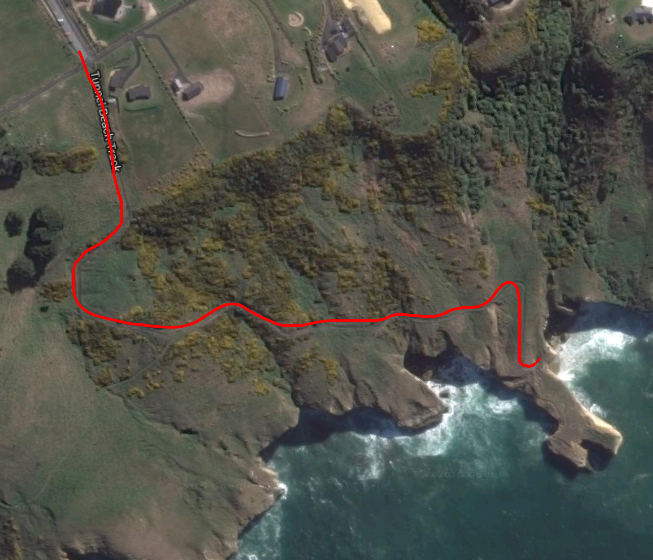 Also incredible that the council still lets people including young children walk out on top next to the cliffs. I hope they make the track from T.B. to Cargill’s Castle. Glad you enjoyed your walk! Yes I hope they make the track too! Glad you got to visit again! It’s a fascinating place! Just visited today 18/8/17for first time.Track was in excellent condition considering Dunedin had serious flooding earlier in the month so full marks to DOC.Noticed some pegs in ground about 100 MTRS above cliff face so decided to investigate and it appears a new track is being formed in the direction of Cargill’s Castle so fingers crossed it may happen. It would be great to be able to walk to Cargills Castle from Tunnel Beach! Bumped into one of the Cargills Castle trustees on the track yesterday – he said that the track route is pegged and easements over the bits of private land are all arranged. Apparently the delay now is from the Parks & Recreation Dept of the DCC. The track is routed along the top of the cliffs, so is above the fairy prion exclosure and safely away from the steep slopes. It will be a wide track, same quality as the Tunnels Beach track, and will be for both walkers and bikers. Looking forward to it! Great news, I can’t wait to walk it! We caught the council bus from Dunedin and walked to the beach from the bus stop at Tunnel Beach. About 2 1/2 hours return, a long walk along the country roads to get to the stile at the start of the walk, but well and truly worth it – such a beautiful, spectacular place. I loved the intrigue of the story that went with the walk and I’m not really concerned with proving it to be true. Sometimes the intrigue and mystery of “the story” is what makes it so special. Planning of coming to Dunedin mid 2019 to visit family with disabled sister, training to get fit, hopefully visit to Cargill’s Castle and surrounding area, partly trained psychic medium, love history and detective work, writing autobiography, British born but spent many years living in Dunedin, visited upstairs of castle 1978.